Great Basin College Continuing Education is pleased to bring the community a variety of classes this summer, including selections in ceramics, karate, CPR, wildland fire training, paralegal studies, weather spotter training and more. As part of its Summer Fun series, the department will be offering two ceramics courses for ages 12 and up as well as Youth Karate for ages 10 and up. “The Summer Fun courses are perfect for students on summer vacation, who want to learn something new and keep active during break,” said Director of Continuing Education Angie de Braga. Ceramics: Hand Building will be offered June 13 through June 22 on Tuesday, Wednesday and Thursday from 1 – 3 p.m. at the Elko campus in the Arts Annex room 101. Cost is $155. Students will use basic hand building techniques such as coil, slab, use of forms and pinch. Course fee includes costs of all materials, firing and tools. Ceramics: Wheel Throwing will be offered June 13 through 22 on Tuesday, Wednesday and Thursday from 5:30-7:30 p.m. also in the art annex. Beginning wheel throwing will be taught. Adults and experienced wheel throwers are welcome to enroll. Cost is $155. Jen and Julius Steiger will be instructing Youth Karate June 14 through Aug. 2 on Wednesdays. The class is open to ages 10 and up and cost is $89. Jen Steiger explained the class will instruct kyokushin, a full-contact Japanese style of karate. “Kyokushin focuses on strength, stamina and sparring techniques. We also emphasize the respect that comes with participating in martial art. It’s all about building up self esteem and confidence,” said Steiger. Steiger will also be instructing a Women’s Karate class this summer. Women’s Karate will be held June 14 through Aug. 2 on Wednesdays from 7- 8 p.m. in the GBC Fitness Center. Cost is $75. Other classes beginning in June include Basic Life Support CPR June 10, Online Driver’s Education June 12 through Aug. 5, Basic Wildland Fire Training- Rookie School June 12, and Fire Operations in the Wildland/ Urban Interface June 13. 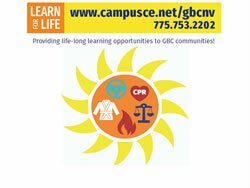 For more information and to view the full summer schedule, visit www.campusce.net/gbcnv or call 775-753-2202. Students can enroll in Continuing Education courses online, via telephone or by visiting the Continuing Education office located in McMullen Hall on the GBC campus, open Monday- Friday, 8 a.m.- 5 p.m.